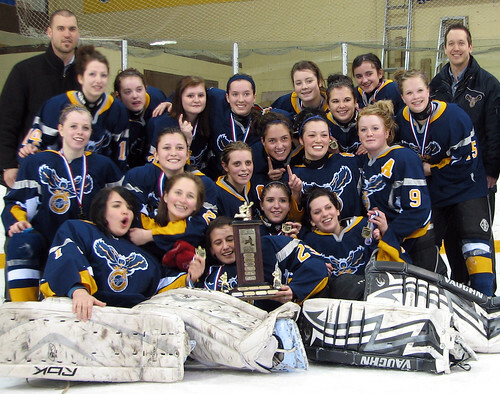 The Eagles girls defeated Kenora 2-1 to sweep the NorWOSSA finals and earn themselves a trip to the OFSAA championship in Wingham on March 22nd. The DHS Boys Hockey team fell to the Fort Frances Muskies in 2 straight games this weekend in the NorWOSSA finals. On Friday night, the Eagles displayed a “never say die” attitude, battling back three times from deficits to send the game into overtime. Despite dominating the play in the Muskie end for most of the OT period, FF scored on a partial breakaway at the 15:23 mark of the first OT period. Zach Lake once again made some key saves in the game despite recording the loss. Goal scorers for the Eagles were Ryan Lobreau with two while Jared Stratford and Blair Dingwall added singles in the 5-4 OT loss. On Sunday, the Eagles just didn’t have the wheels to pull of the win. FF scored on the power-play twice in the game and added an empty net to win by a 3-0 margin. Congratulations to both teams for your hard work and great seasons. Good luck at OFSAA, girls!